In a large bowl, mix egg yolks, sugar and oil together, mix well with a hand whisk. Add lemon juice, lemon zest and yoghurt into it, mix well and till smooth. Sift in the plain flour and mix well. In a mixing bowl, whisk egg whites till frothy, gradually add in sugar. Continue whisk egg whites till stiff peak but not dry. Spoon batter into 9 cupcake liners to half. Place blueberries over it and spoon remaining batter to ¾ full and bake for about 25 minutes. Bang the baking tray together with the small cakes on the counter top 2-3 times once they are straight out from the oven, as this will prevent the cakes from shrinking. Leave cakes to cool before consuming. Hi Ann. May I know whether can bake multiple pan of cupcakes (multi layer) in the home oven (52L) at once? Hi Alviss, It takes longer time to bake the cupcakes in multi layer because you need to move the tray up and down a few times to bake the cake to fully cooked. Hi Ann thank you for saying the weight of the eggs now I can make them.I have just scoured the net looking for weights and no one give details but you. HI Ann, can I bake this in a loaf pan or normal 6” diameter round pan using this chiffon recipe? Hi Yvonne, sorry for the late reply due to the internet line down yesterday. Yes, you can use a 6 inch round pan to bake this cake. Thank you so much for your reply. ?? Is Plain Flour = All purpose flour or Plain flour = Cake Flour? I followed urs recipe except I used soft cupcake liner instead of hard liners. My cup cakes sank in within 1 min. May I know why? Tq for sharing d recipe it is super soft n nice. Hi Joanna, I’ve not tried to use soft cupcake liner to bake chiffon cake yet. Probably due to to paper liner is too light and soft to hold the shape during baking . Better to use those hard cupcake liner instead. 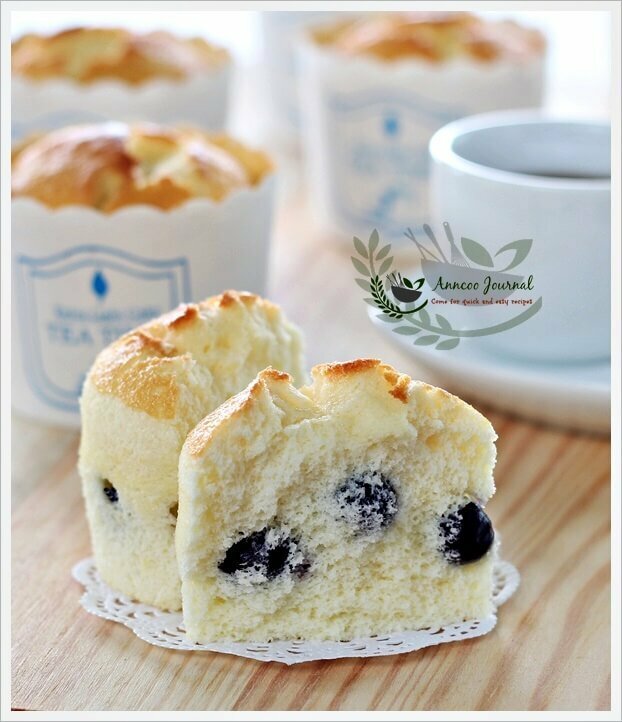 Hi Ann, I hv just try making d Yoghurt Blueberry Cake….and would like to know if I can’t finish all d cup cakes, must I put in the fridge for tomorrow bfast or just leave it outside? Pls advise…tqia. Hi Patricia, yes keep the cupcakes in the fridge in an airtight container. The cakes stii stay soft after chilling. What do you mean by ‘bang”? Hi Shokara, Is exactly the way you’re banging a tray on the table. Thanks for sharing recipe. Ya, the blueberry from Mexico was cheap. Last week at Giant supermarket, it was selling at S$2 per punnet. However, two days ago, it was offering at S$3.95 for two punnets. Very good and fresh blueberry. I bought a lot too to give to my neighbour who is from Panama. Sorry Ann I mean can i use frozen blue berries in this recipe Thanks! Hi Judy, Sorry for the late reply because I just came back from a short trip. Yes, sure you can use frozen blueberries or any other berries you have on hand. Hi Ann, may i know can i use frozen in this recipe, thanks! Hi Ann, I only have medium eggs in my fridge, can I use 4medium eggs instead of 3large eggs? Hi Serene, Sure you can use 4 medium eggs or measure the eggs to 210g. These look awesome! I am going to make a batch right now! they look so nice and light! 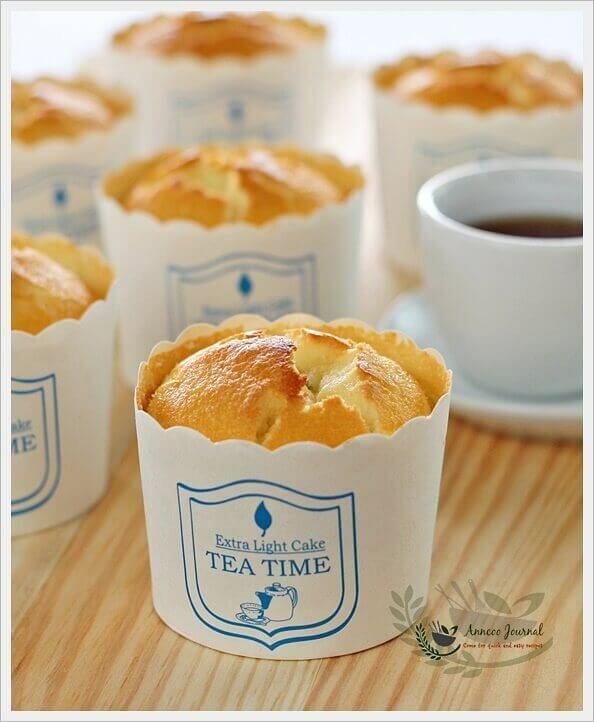 Forgot to say that these cupcake liners match with the cake perfectly, "Extra light cake!" Can i use frozen i/o fresh blueberry ? Hi Mannee, Yes you can use frozen blueberry but the berries might burst during baking due to high water content. Hi Ann, never get sick of blueberry recipes, haha. I had tried your previous recipe & now, I'm also taking this recipe home! Hi Ann, I baked these cakes today and they were really soft, light and cottony! Yummy! However mine did not rack nicely like yours….mine looked like Hokkaido Chiffon cakes (flat on top and crack at the side). Can you advise how do I get a nice crack like yours? If I want to make it sweeter, how much sugar must I use? Is it ok to omit the lemon zest and increase lemon juice? How much lemon juice must I use? Thanks so much for your help! Hi Ai Li, I think probably due to the inconsistent of the oven temperature heat that cannot control by us. Yes you can add more sugar if you like, maybe 10g or more. For the lemon juice, can add any amount to your liking and no problem to omit the lemon zest. Love this fluffy light yogurt chiffon cake! I finally got my hands on some fresh organic blueberries and I've been deciding on just the right dessert ot use them in. Looks like I found it Ann! These Blueberry Yogurt Chiffon Cupcakes are gorgeous! Marion has been asking for another Chiffon Cake ever since I baked that last one with pineapple frosting. I have a feeling she wouldn't mind at all if I baked these instead! Hi Ann, came from G+ as I commented on this there. Looking at the ingredients state corn oil. I've never heard of this, we have sunflower, vegetable and rapeseed oil here. What would you substitute these with? Usually I substitute using vegetable oil on all recipes that state canola oil. Hi Lisa, Yes you can use any type of vegetable oil you have on your pantry. Hi Ann, I have tried your blueberries yoghurt berries cake and it was amazing! This looks like a good recipe to try too! Yum. I am sure the blueberries add such a nice texture. Hi Ann, one more cupcake recipe added to my must try. The cupcakes look light, soft and fluffy. Definitely delicious. These are so pretty and fluffy. Yum! Hi Ann, this cupcake looks very refreshing, bookmarked also. Pictures look gorgeous as ever! I'm so impressed by how nicely your tops turned out. Wish I had your skill, but I will totally try. Who could ever resist those little beauties? They are perfect, Ann. 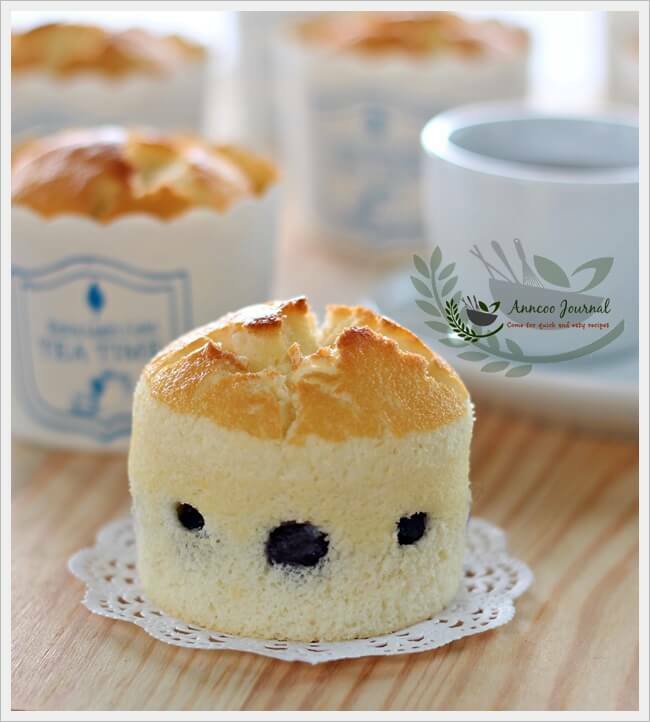 recently I also use a lot of blueberries too, this cupcakes sound very refreshing! The blueberries were nicely floating in the middle of the cake. Well done! Looks really yummy. Ann, how can we get tired of your blueberries and yoghurt? These chiffon cupcakes are real beauties. Want to bake also! I must say your chiffon cupcakes looks so tempting. Love the fine texture of the chiffon. I am tempted to make these. Thanks for sharing Ann.